Ford, Renault-Nissan and Daimler have agreed to jointly develop a fuel cell system to try to speed up the availability of zero-emission vehicles. 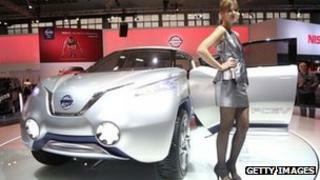 The carmakers hope to launch "the world's first affordable, mass-market fuel cell car" by 2017. A common hydrogen electric fuel system will be created that will be used in different vehicles. The three companies want to encourage others to push on with developing the necessary refuelling stations. Fuel cell electric vehicles generate their power from hydrogen and oxygen, and emit only water. "Working together will significantly help speed this technology to market at a more affordable cost to our customers," said Raj Nair, group vice president of global product development at Ford. "We will all benefit from this relationship as the resulting solution will be better than any one company working alone." The statement from Ford, the Renault-Nissan alliance and Daimler stressed the geographic spread of the firms. It also said it hoped their co-operation would help "define global specifications and component standards, an important prerequisite for achieving higher economies of scale". Dr Anthony Baxendale, manager of Future Transport Technologies & Research at Mira Ltd, a UK firm focusing on creating advanced vehicle and systems technology, said this type of fuel cell had been "bubbling under" for a while. But the main problem in the past had "been how to get production volumes up in order to get prices down". "The production cost until now has been prohibitive, so by collaborating and joining forces they will be hoping to accelerate development," he said. "The technology is there - it has been the costs that have not been viable until now. The time is right too - it plugs into a growing market for electric cars," he added. The fuel cell development work will use existing facilities, including the site of a joint venture between Daimler and Ford to develop fuel cells in Vancouver, Canada. Renault-Nissan and Daimler have been forming an increasingly close partnership since 2010. Last year, they announced an engine-sharing agreement. Will carmaker alliances result in identikit cars?